Snow is about to fall at the end of the autumn term at Drysdale’s School. Flame is agonising over her relationship with Quinn, while Marina is busy rehearsing for her leading role in the school play. Late one afternoon, Ash’s intuition is alerted by the curious behaviour of twin boys new to the senior school. She follows the twins to the headmaster’s office, but they vanish into thin air. 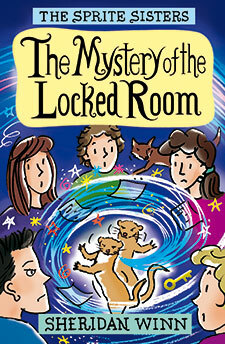 When the locked room is found ransacked, Ash is certain the twins are responsible – but how did they get in? Back at Sprite Towers, Ariel soon has a theory. The Sprite Sisters quickly realise the Treadwell twins are much more than they appear to be. When one of the sisters is hurt, and with havoc created at every turn, the Sprites must act quickly. But have they met their match in the twins with the beady black eyes and strangely pointed teeth?